What is Native 64-bit Software? A piece of software that is natively 64-bit, or simply 64-bit, means that it will only run if the operating system it's installed on is a 64-bit operating system. When a software developer or company calls out the fact that a particular program is natively 64-bit, it means that the program was written to take advantage of the benefits of a 64-bit operating system, like a version of Windows. See 32-bit vs 64-bit: What's the Difference? for more on the sorts of advantages that 64-bit has over 32-bit. How do you tell if a program is natively 64-bit? The native 64-bit version of a software program will sometimes be labeled as the x64 version or more rarely as the x86-64 version. If a software program doesn't mention anything about it being 64-bit, you can almost guarantee that it's a 32-bit program. Most software is 32-bit, is rarely explicitly labeled as such, and will run equally well on both 32-bit and 64-bit operating systems. You can use Task Manager to check which actively running programs are 64-bit. You're told next to the program name in the "Image Name" column of the "Processes" tab. Should you choose native 64-bit software when possible? Yes, you should, if of course, you're running a 64-bit operating system. Chances are, assuming the program was well designed, the 64-bit version will run faster and generally perform better than the 32-bit one. However, there aren't many reasons to completely avoid using a program just because it's only available as a 32-bit application. Just like with 32-bit applications, 64-bit programs can be updated manually by downloading the update from the program's official website (and maybe others). You might also be able to update or reinstall a 64-bit program with a free software updater tool. Some websites will automatically download the 64-bit version if you're running a 64-bit version of Windows. However, other websites may give you the option between the 32-bit and the 64-bit download. Even though 64-bit applications may be different from 32-bit ones, they're still uninstalled in the same way. You can remove a 64-bit program with a free uninstaller tool or from within Control Panel in Windows. 32-bit versions of Windows can only reserve 2 GB of memory for a process to run. This means more memory can be used at once if you're running a 64-bit application (which can only run on a 64-bit OS, which doesn't have the 2 GB limitation). This is why they can provide more power and features than their 32-bit counterparts. 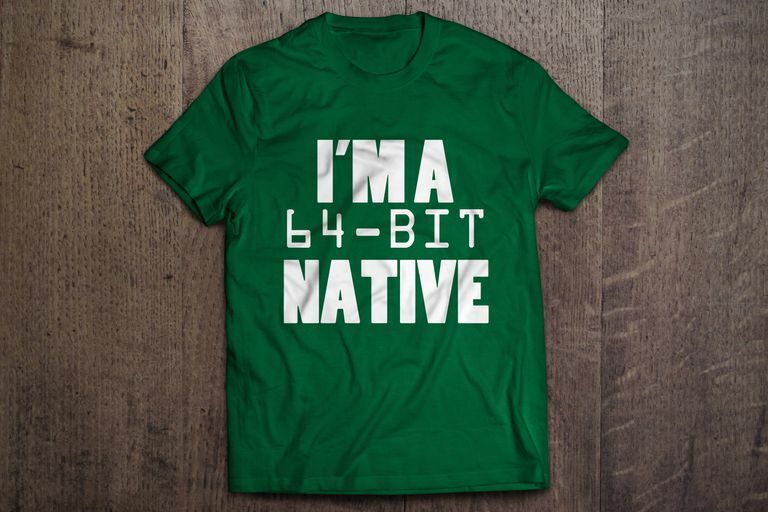 Native 64-bit software isn't as common as 32-bit software because the developer has to make sure that the program code can correctly execute and run on a 64-bit operating system, which means they have to make changes to the 32-bit version. However, remember that 32-bit versions of programs can run just fine on a 64-bit operating system - you don't have to use 64-bit applications exclusively just because you're using a 64-bit operating system. Also, remember that the opposite is not true - you can not run a 64-bit piece of software on a 32-bit operating system.